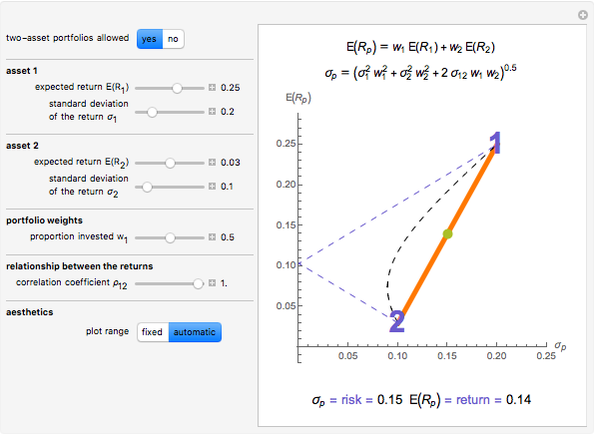 Set the "two-asset portfolios allowed" toggle to "yes" to visualize the relationship between risk and expected return for two-asset portfolios, for varying levels of expected return and risk for the two individual assets, and of the correlation between their returns. 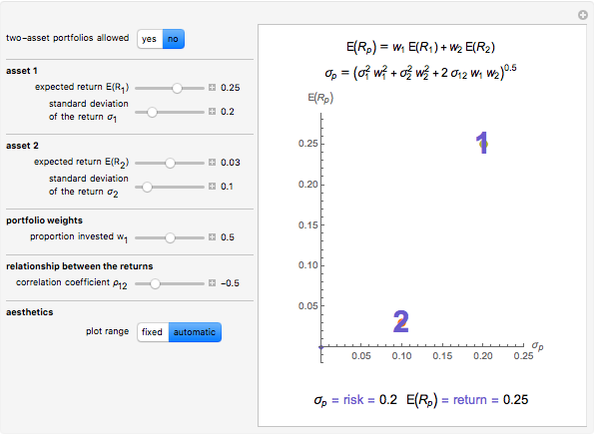 The loci of all possible two-asset portfolio risk and return combinations is called the two-asset feasible set. For two risky assets the orange straight dashed line shows the two-asset feasible set for the case of perfect positive correlation; the black dashed curve shows the two-asset feasible set for the case of zero correlation; and the two slate blue dashed line segments show the two-asset feasible set for the case of perfect negative correlation. 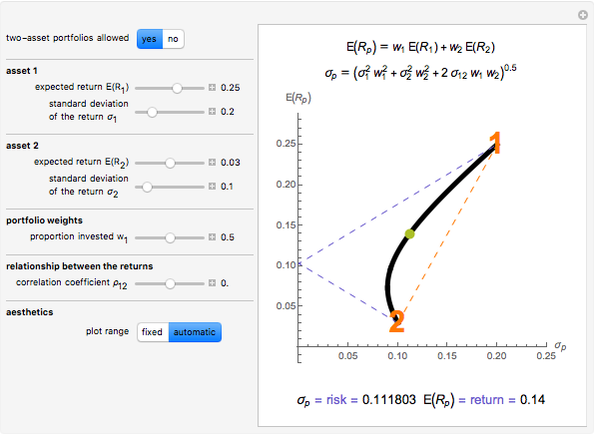 The thick blue line shows the actual two-asset feasible set given the actual selection for the (Pearson) correlation coefficient, while the green ball shows the actual risk-return combination given the actual proportion invested in asset 1. The Demonstration does not allow for short selling of any asset. When the "two-asset portfolios allowed" toggle is set to "no" a proportion invested in asset 1 exceeding (or falling short of) 0.50 is treated as 100% invested in asset 1 (or 2). Jim R Larkin "Two-Asset Markowitz Feasible Set"